LinkedIn Sales Navigator is LinkedIn’s solution to social selling. LinkedIn Sales Navigator is a sales prospecting tool that allows you to build and nurture relationships using the LinkedIn platform. What is social selling exactly? It’s pretty much just what the name sounds like — utilizing online social channels for selling purposes. Sales professionals interact with prospective customers through social media by answering questions and providing helpful content in order to move the potential customer through the sales funnel. Outbound prospecting: involves gathering intelligence and learning as much as possible about your customer base. Inbound marketing: is the process of building a pipeline of leads by providing content, such as in the form of newsletters, blogs, and postings on social media platforms. Most sales teams are already using tools like LinkedIn and Twitter to learn about their customer bases. It’s the process of building an inbound marketing system, however, that’s the hard part. That’s because the process of discovering, curating, and sharing content can take significant time from someone’s day. This is why LinkedIn Sales Navigator is such a game changer. It gives you the ability to do both outbound prospecting and inbound marketing all on one platform. Create a professional brand. Having a strong professional brand shows prospects that your company is active in all areas of the industry. Customers only do business with brands they trust. Focus on the right prospects. LinkedIn states that over 76 percent of buyers are open to having a conversation with a sales professional via social media. Sales Navigator helps you identify the right decision-maker with whom to have this conversation through the use of filters and advanced search functions. Engage with insights. Position yourself as a subject matter expert and thought leader by sharing helpful industry news as well as commenting on posts made by others. This helps salespeople remain in potential clients’ minds. Build trusted relationships. Establish a rapport with prospects by identifying a common ground. Provide relevant content that addresses their pain points as opposed to some generic sales materials that try to cover every feature of your product. 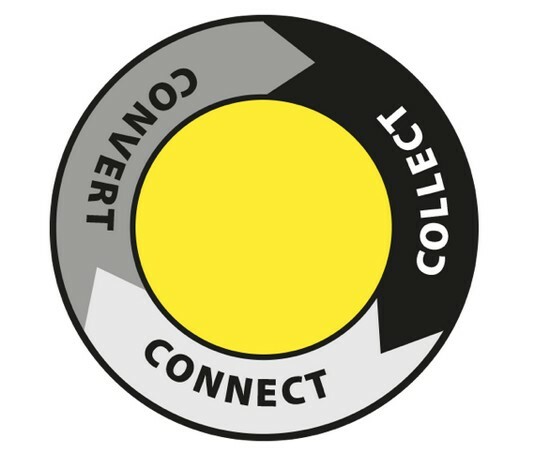 Collecting: This is how a business gathers its intel about contacts and leads. The methodology used differs depending on the organization and where the potential customer is in the buying cycle, but collecting generally includes things like capturing email addresses via landing pages, webinar sign-ups, and opt-in forms. It’s best to try out different collection methods to ensure you’re using the best one for your needs. Converting: Now you get to enjoy the fruits of your labors. Converting is when the potential customer becomes an actual customer, or at least becomes a well-qualified lead. The point is that the customer took a direct step further along the buyer’s journey, be it scheduling a demo or making an actual purchase. The three C’s of online sales. The three C’s may seem overwhelming or maybe even like a waste of time. You may even be tempted to skip a step or two. But never fear! LinkedIn created a helpful, robust sales tool that helps professionals move through those stages (hopefully) without a hitch. You’re probably eager to jump right in and start tinkering around with LinkedIn’s Sales Navigator. If you take nothing else away from this book, however, take away the fact that you have to have a plan. The saying, “if you fail to plan, you plan to fail,” exists for a reason! So, before you can get into the nitty-gritty of Sales Navigator, there are a few topics to discuss to ensure you make the most out of your subscription. The first of those topics is the Social Selling Index (SSI). SSI is the measurement of how your sales activities are performing. 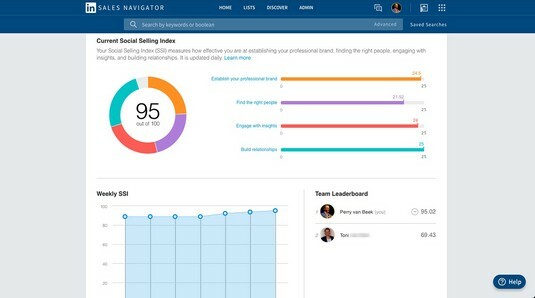 Sales Navigator has a special SSI dashboard that paints you a picture of how your social-selling endeavors are going as well as how you stack up against your LinkedIn network as a whole. It tracks your progress over time, showing you where you’re performing the best and where there’s room for improvement. The SSI dashboard illustrates how you’re performing on each of the four elements of social selling — establishing your brand, finding the right people to connect with, engaging with the data gained through insights, and building relationships with both your sales peers as well as prospects. Get a clear picture of your Social Selling Index on your dashboard. The Social Selling Index isn’t just some gimmick LinkedIn thought up to give sales professionals something cool to look at. LinkedIn data shows that social-selling leaders — those individuals with high scores in all four categories — create 45 percent more opportunities than their peers with lower scores, and they are 51 percent more likely to reach their sales quota when utilizing this data to improve their social-selling skills. The numbers don’t lie, folks! Social selling is imperative for success in sales these days, and keeping an eye on your SSI in LinkedIn is the perfect way to ensure you’re staying at the top of your game. If you have a Team- or Enterprise-level Sales Navigator plan, you have access to an extremely helpful feature called TeamLink. TeamLink is a tool that allows you to view and search the connections of the team members with whom you share a Sales Navigator account. Even if you’re not directly connected to your teammates on LinkedIn (and why not? ), you can still view their first-degree connections (in other words, the people they are directly connected to), thereby opening up your network exponentially. You don’t have this capability with personal LinkedIn profiles or with the Professional-level Sales Navigator plan. In the Team- or Enterprise-level plans the TeamLink feature is enabled by default in the Settings menu, which is also where you can choose to turn off the feature if you see fit (but why would you?). With access to this information you can easily see who on your team can connect you with potential leads. The search function even suggests the best path to take in terms of who to leverage in order to make these introductions to the prospect. Everyone knows that one of the hardest parts of sales is having to make cold calls, but with TeamLink, this “call” warms up considerably, increasing your chance of making a successful connection — and maybe even a sale down the line. Sales Navigator even gives you the option to just show TeamLink leads when searching for prospects, as this can often be the most low-hanging fruit. The SSI and TeamLink options are two of the most important (and robust) tools you have at your disposal when you use your Sales Navigator account. Now that you have the ability to identify warm leads (TeamLink), you can focus your social-selling efforts on connecting with those leads all the while ensuring you’re on the right track by keeping an eye on your SSI score. Just like it is with social media marketing in general, utilizing the data generated to improve upon not only how you approach prospects, but also how you interact with them and what information you provide to them, and then adjusting as needed, will really help you move the customer along the sales funnel. Every prospect has his or her own personal buyer’s journey. The key to success is being there every step of the way.